Facebook not loading properly on any of your browser? What happen to Facebook? There were instances that Facebook website is down which causes the Facebook not loading error. However, as you continue to read this post, you will know that, it is not always the case. The culprit/s includes your computer time settings, browser extensions, third party software, antivirus software or your PC might be infected by virus. But don’t worry, you are in the right place and you are in your way to solve your Facebook not loading properly error. Simply follow the easy steps below. Facebook not loading properly on Google Chrome. Facebook not working properly on Firefox. Not displaying properly on Facebook. Hot Topic: Facebook Account hacked. What to do? Update: March 13, 2019 | Facebook is down in some areas of Europe, America, Asia and other parts of the world. Facebook users as of this writing, will find it hard to login and update their Facebook status. WhatsApp and Instagram suffers the same issue. Many believed that it’s a DDos attack but Facebook said it’s not a hacking issue and they are doing everything to restore the biggest social site. As of ( March 13, 2019) UTC +08:00 Some users are now able to access Facebook, it seems gradual restoration is in effect. So let us just wait until it will finally resolved. Facebook not loading and other problems mentioned above are very common among Facebook users. However, Facebook has nothing to do with it. The problem usually lies on a Facebook user’s computer or gadget. Facebook user’s computer time settings are incorrect. Incorrect time settings will lead Facebook not displaying properly. In my experience, if your computer time and date is one (1) week later, Facebook won’t load properly even if you have the fastest internet connection and great computer specification. This fact is oftentimes overlooked even by the system administrators. So it’s worth looking into this issue first before proceeding into another possible reason of Facebook display problems. Browser add-ons are helpful in making your surfing experience a whole lot easier. However, too much as always, is not good. It can be the cause of Facebook not working properly. Choose only add-ons from trusted sites and the one that is useful for your tasks. Keep in mind that some browser add-ons are the source of phishing technology that will not only harm your Facebook experience but as well as your privacy. Facebook cannot load properly, is sometimes due to Security Software such as Antivirus and Internet Security. Check your Antivirus, especially if you are using Internet Security software. Make sure that the Facebook website is in your Internet Security exclusion list. Why Facebook is sometimes blocked by Security software? It’s what we called False Positives, security software was programmed to do things according to how it is being scripted. We have to understand that the one who coded it is human, and human sometimes makes mistakes. The Exclusion list, is what we called safety net for Antivirus in case it reacts differently towards trusted or a legitimate Website or software, and Facebook is one of it. Facebook not loading properly problem is sometimes caused by cache and temporary files. Most browsers use cache, cookies and temporary files technology to improve the user browsing experience. It stores data for the purpose of easy retrieval in case the user asks the same content. However, there are times that it encounter problems. Thus, displaying website content can be affected. In this case you have to clean or clear your browser’s cache and temporary files. Usually, after clearing your cache and temporary data, your Facebook must display correctly now. Nevertheless, if the problem continues, check the below instruction. Having problem clearing cache, cookie and temporary files? Check this out; How to delete or clear cookies, cache and temporary data. One of the reasons why your Facebook, loads slowly and cannot display properly is the virus. Browsers are an easy target, just a simple download or just a visit of any malware infected websites, your browser can acquire a virus. Then it starts to change your browser settings to its advantage and you are unaware of it. After a while, when you are trying to log in with your Facebook account, all you can see are texts, no pictures even the Facebook button isn’t colored. In this case, download Malwarebytes latest version, then install. If you are having problem in installing it see this How to fix Malwarebytes runtime errors. Run the update and scan your Computer. To make it safer, uninstall your browsers. Download the latest version of Google Chrome and Mozilla Firefox and install respectively. There you have it, you can now log-in to your Facebook without loading and display problems. Recent problem occurs to some Facebook users. Every time they load Facebook in their browser it displays encrypted text. It is due to Facebook turning on Brotcoli encoding. Due to that issue most Kaspersky Internet Security users encounter Facebook display error. As a temporary workaround, it is advised to temporarily turn off “Privacy Mode” via settings. Fortunately, this issue is already solved. What if, Facebook still won’t load after following the steps above? 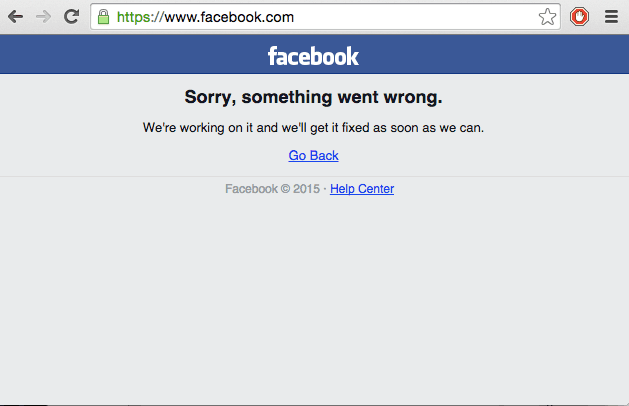 Chances are, Facebook servers is DOWN. Yes, it can happen anytime even to gigantic and popular websites like Facebook — nothing is invincible in this world. So, what to do? You have to wait a couple of minutes and try to revisit it again if it’s now loading properly. Usually, you will see an error or notice as shown in the image below. Do you have any smarter idea or experience on solving Facebook loading and display problems? Please share it with us. Still having problems loading today since 7:30 a.m. this morning. Not usually a problem. All day today it won’t load the pages. Facebook stopped loading on my Windows phone after I did an update last month. Works on my laptop but not on phone. No one can seem to help. It still continues to freeze and can’t page down. A year now. Clearing browsers, cache, etc. does not fix it. It only happens on Facebook. No other site. Facebook dump all the apps there making things not work on website on window 7 and 10 its one big mess up go back to the old ways it work so good not slowing things down like the apps are making one big mess of things . if a thing works good like the old way don’t break it with the dumb apps CAN NOT LOGIN TO CRACKLE FOR MY TV ON 9 10 7 tells my my logins are not right good one Facebook. thANK YOU! Hard refresh with ctrl did it! Hello Christine, It’s good to know that your Facebook loading problem was solved. Thank you! You solve my Facebook not loading error.